It was Black Friday, the day after Thanksgiving, when those not still under the effects of tryptophan hie themselves to the nearest mall or shopping center or big box store. But for the modern explorer, the day after Thanksgiving is often a great day to go off into the wild, far from the crazed consumers. So my friend Tsuki and I decided that this was how we would spend our post-Turkey Day, for which we gave appropriate thanks. You have to plan a little when going on photographic expeditions in the late fall and in the winter, even for relatively random travellers like us. Though we discussed going somewhere in eastern Ohio, we’d be faced with a lot of glare from the annoyingly-positioned sun, which can really mess with one’s roadside photography options due to glare. The safest alternative was to head west and north, a direction from which the sun could least interfere with us, so that is what we decided to do. Because I had already taken several trips to the northwest over the past month (for exactly the same reason), I wanted to skirt the areas I had recently covered. So we decided to head west on the highway to Springfield, then start taking backroads to the north and west. We had no plans for lingering in Springfield, but I ended up causing us to spend quite a lot of time in that one location—and Tsuki good-naturedly indulged me. This was very satisfying to me because in my years of excursions, I had rather given Springfield the short shrift, mostly because it is so close to Columbus (it is about 30 miles to the west). On my outbound travels, therefore, I often wanted to get further away from Columbus. While I would sometimes travel through Springfield on my return journeys, the time was usually bad and I would arrive in low-light or dark conditions. So I would frequently just breeze through the place. But Springfield is actually quite interesting. Allow me to wax eloquent on Springfield for a moment. Springfield (population 60,608, salute!) 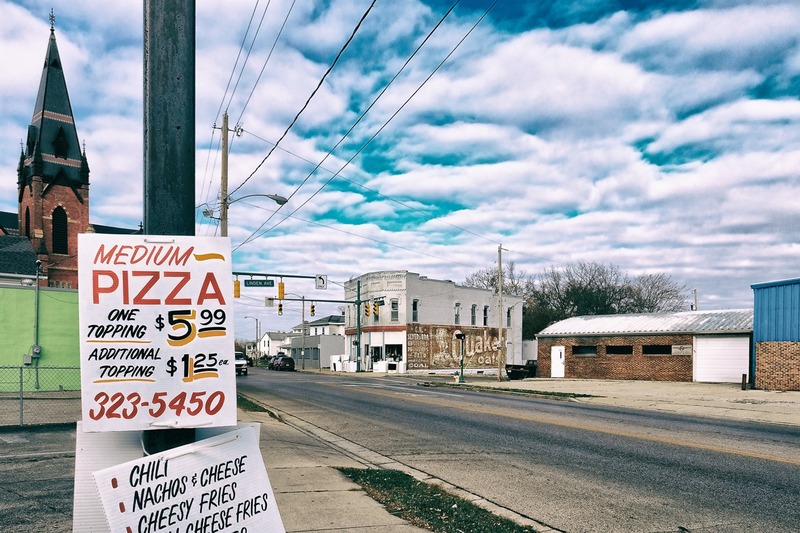 is a small city/large town that might well have become a much larger town had it not been so close to two other locations: Columbus and Dayton. In another universe, it might well have been Springfield that was more prominent. Once, they were not so very far apart in population. In 1870, for example, Springfield had a population of 12,652. Dayton had a population of only 30,473, and Columbus had a population of 31,274. Columbus soon began to take off in population. Though it was not as heavily involved in manufacturing as many Midwestern towns and cities, it had the advantage of being a state capital and center of learning. Dayton and Springfield, however, were industrial cities, and it was industry that fueled their population booms. However, Dayton won out, eclipsing Springfield (by 1920, Dayton had 152,559 souls, while Springfield had only 60,840). Many people who might otherwise locate in Springfield (including many native Springfielders) would instead go to Dayton or Columbus. 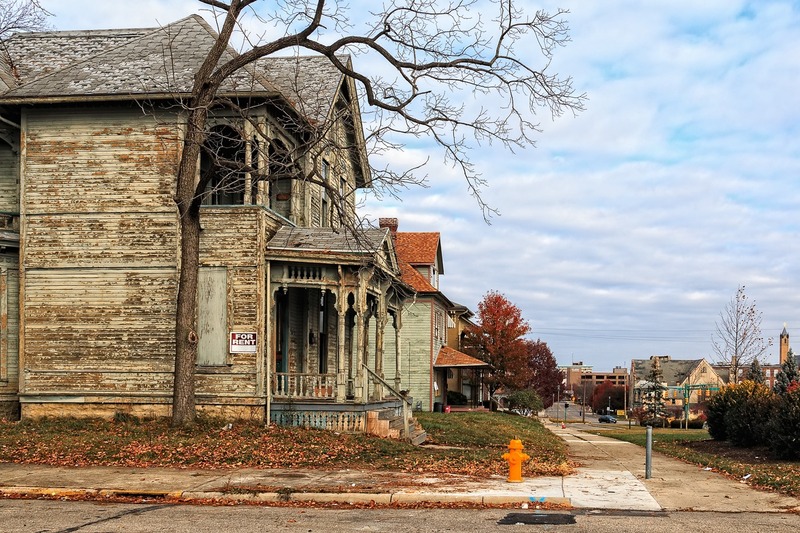 Dayton and Springfield both suffered, however, the collapse in population experienced by many Midwestern towns and cities (unlike, Columbus, which would continue to grow and thrive). Both cities’ populations peaked in 1960 (Dayton at 262,332 and Springfield at 82,723) then suffered decade after decade of decline. 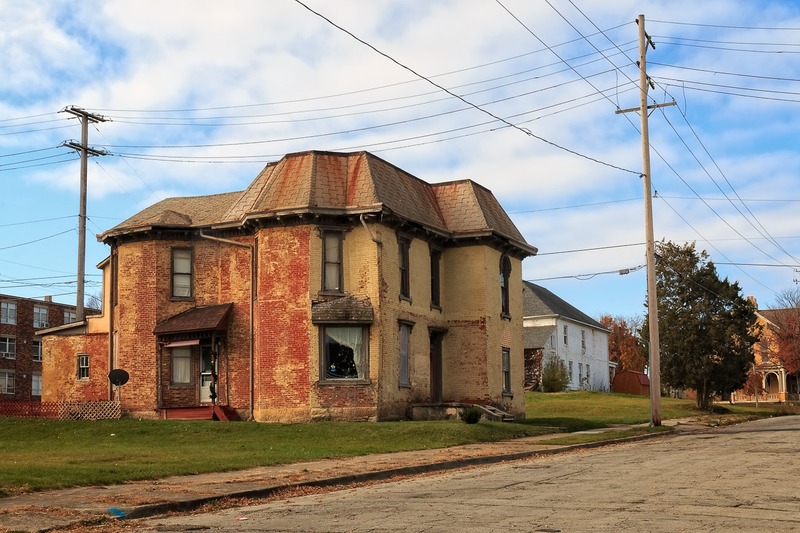 Today, Dayton is approximately half the size it once was, while Springfield lost about a quarter of its population. 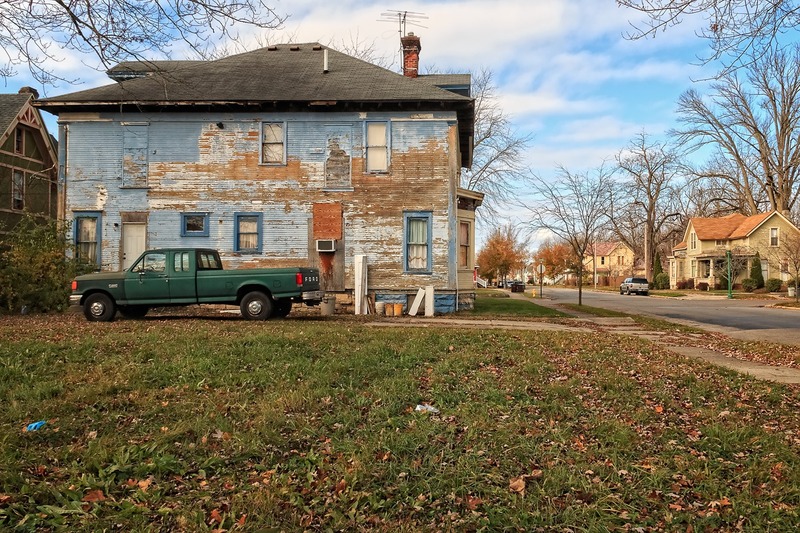 In Dayton’s case, some of that population just moved to its many suburbs, however—but Springfield has no suburbs to speak of. It just lost those folks. I mention all this because, in the late 1800s and early 1900s, Springfield had a glorious period, when wealth came to the city thanks to manufacturing—to Champion Farm Equipment (International Harvester/Navistar) to the Standard Manufacturing Company to no fewer than 10 pioneering automobile companies in the early 20th century. A few of those companies—Navistar is one of them—still exist in Springfield, but many others have relocated or gone under, unreplaced. But during Springfield’s “Edwardian” era, all of this was still in the future—a future that at that point must have still seemed very bright. And the wealth and prosperity of this small city was reflected in its architecture, from factories to office buildings to many large, elaborate houses, designed for full families with firm futures. And a surprising number of these have survived, though many are in parlous condition. 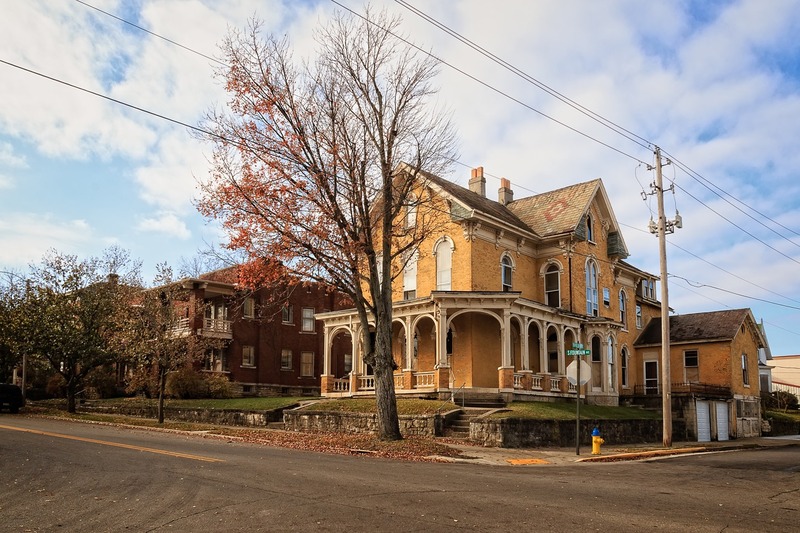 Springfield is full of old neighborhoods that once sheltered the cream of Springfield society—residences that were practically mansions in size and ornateness. 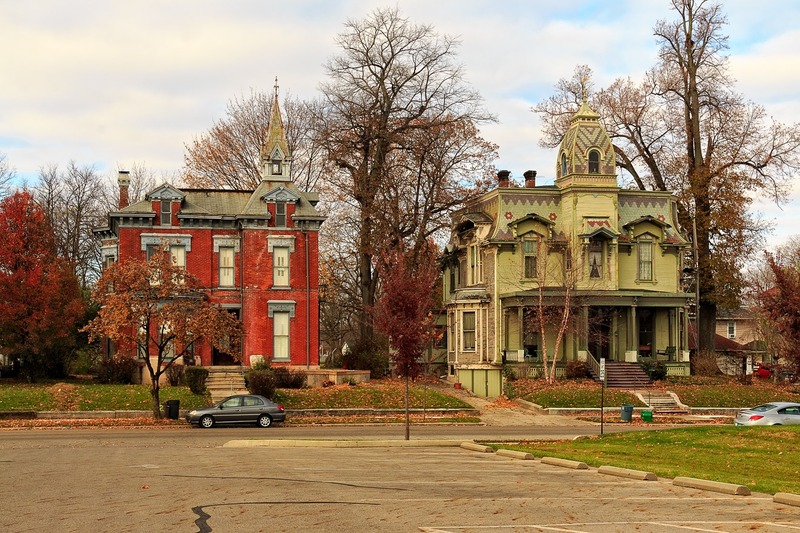 These two wonderful houses—some of the many fascinating houses on South Fountain Avenue—are excellent examples. What I would give for a house with a tower! 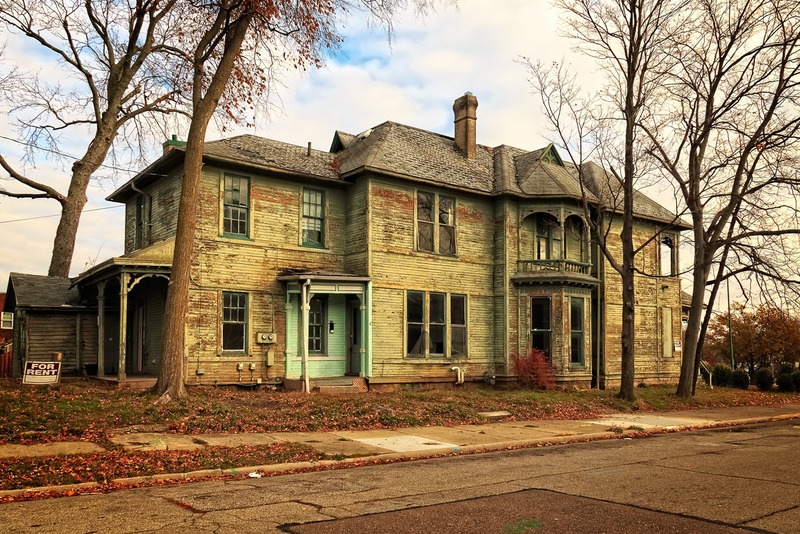 How amazing, how simply amazing—and yet such features were at one time not so very rare in upper class neighborhoods in Springfield (and many other American cities). From the exteriors at least, both houses seem reasonably well-preserved—in fact, the Google Maps Street View of these houses, which dates from 2007, shows restoration/repair work being done on the house on the right. The attention to detail, such as the patterns on the upper areas of the right-hand house, is wonderful. Now here is a once-illustrious home that you could actually live in, if you so chose, if the “for rent” sign is any indication. 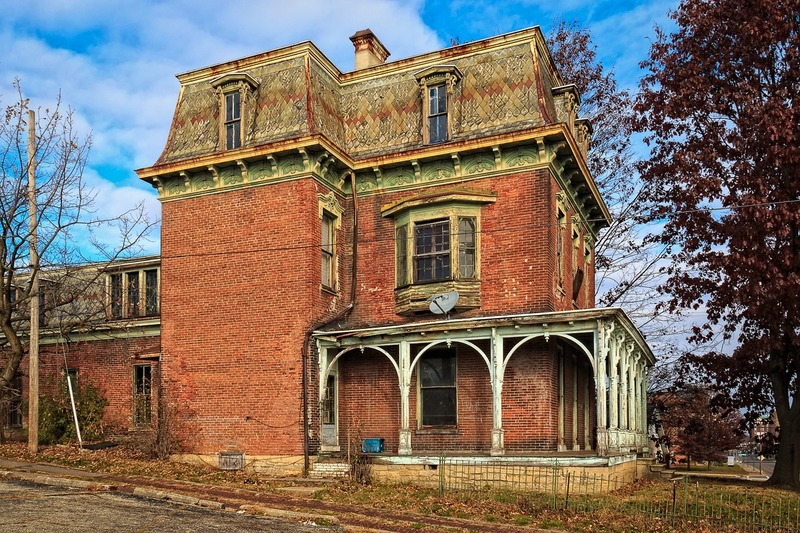 Sadly, however, this house is long since past its prime and has not been sufficiently maintained. How anyone could refrain from sinking their every last nickel into such a beautiful structure is beyond me. This is no McMansion, this is a one-of-a-kind house, with fascinating design—and again, that great attention to detail. 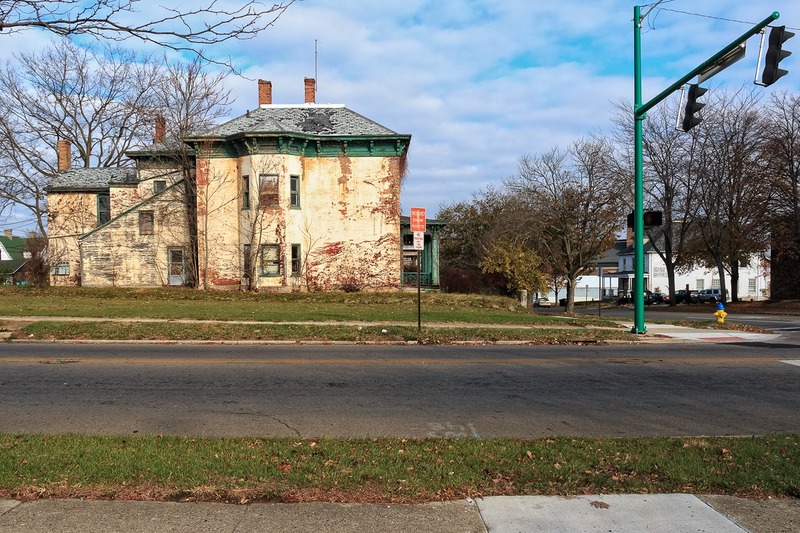 Ten years ago, it would have been more difficult to see this house, even in November, because there were far more tree on the lawn—more than a dozen—which greatly obscured one’s view of the house. 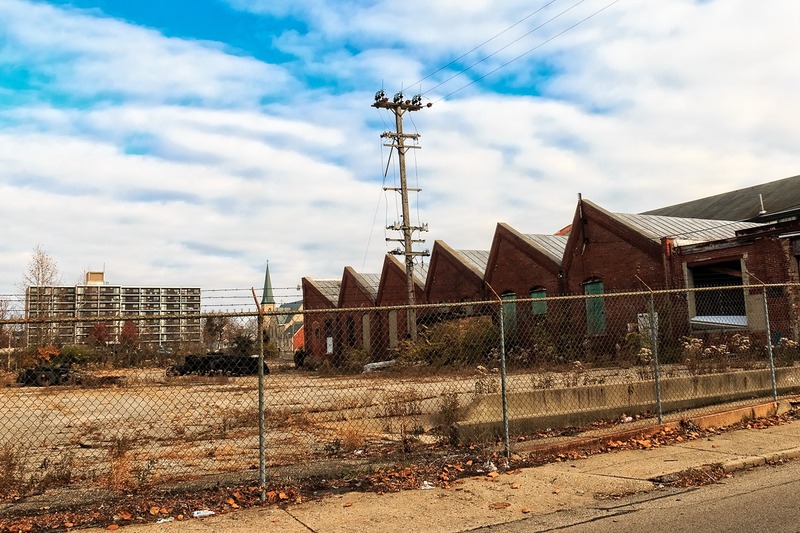 However, most of these have been removed—probably wisely—and, with the absence of foliage, one is now allowed a full view of this once-wonderful place (on East Clark Street). 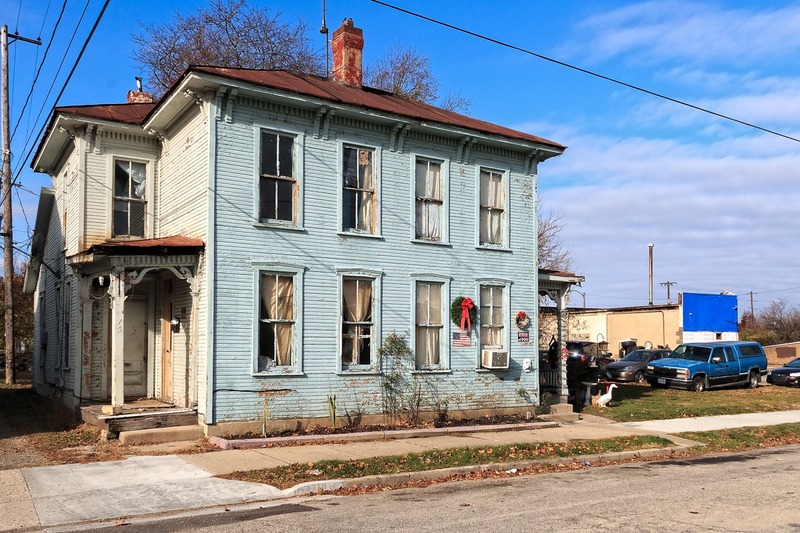 It was actually this house, which can be seen from one of the main entryways into Springfield, that spurred me to go “off-book,” as it were, and not simply drive through Springfield but spend a little time there. I knew I had to get a photo of the house. But, because of its location, it was not easy to get to a vantage point (from a vehicle), so I ended up having to drive around a bit, which led me to more houses and those led me to others and so forth. Here is a shot of the front end of the house (we previously had seen it from what one could call the “right rear.” The wear and tear is even more visible in this shot—but more great features are revealed, such as the upstairs porch (to accompany the other upstairs porch on the side of the house). Here’s one final shot of this house, from yet a third angle. Yes, I was obsessed with this place, but surely you would be, too, no? I could easily imagine it as the setting for some fantastic steampunk novel written by James Blaylock. 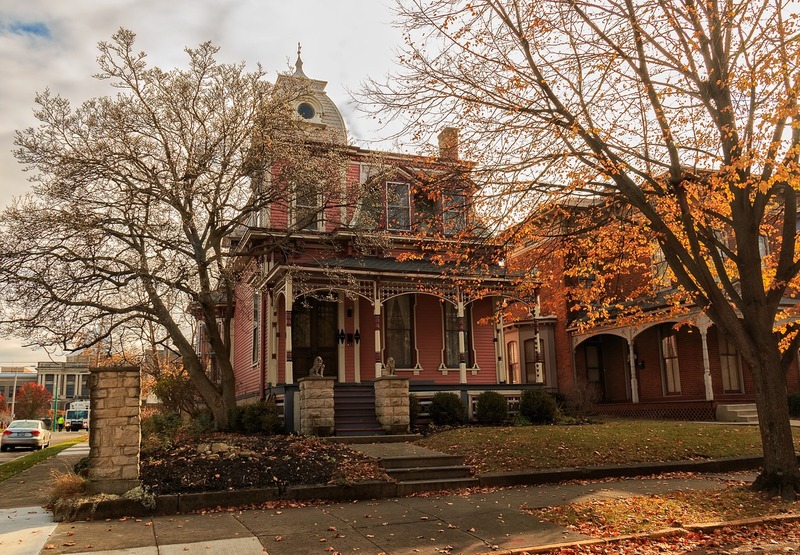 Ephraim Nelson Pickwick, an eccentric inventor lives here, and has filled many of the rooms with his elaborate laboratory equipment as he seeks to discover the source of the mysterious aether. Meanwhile, his twin wards, Arthur and Andrew, have discovered a strange and sinister tunnel in the basement…. Not far away, on South Limestone Street, is this relic of that once-grand era. From its splendid sweeping porch to its elaborate upper level design work to the protruding window on the left, it’s a great specimen. It seems to be abandoned. Here’s another shot from a side angle. You can see from the satellite dish that it was occupied not all that long ago. Definitely abandoned is this old factory. The property appears to be owned or leased by the Hursch Container Company, which makes boxes, but doesn’t seem to use all of the property. This previously may have been the site of the Springfield Equipment Company, an interesting company linked to or owned by International Harvester, which took IH trucks and vehicles and modified them to create specialized vehicles such as ambulances, limousines, and so forth. It later moved to Dayton. In the background can be seen Springfield Towers, a rent-assisted low-rise apartment building. C.N. 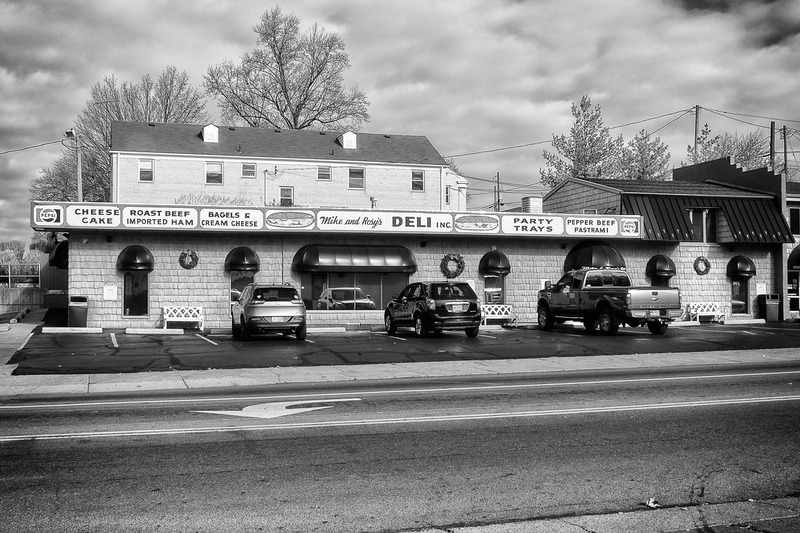 Slyer was a local businessman; in 1902, he owned a meat market, though not at this location. It appears that he may have done some residential development work, too, building & selling homes. The “C” in Slyer’s name seems to stand for Charles, who pops up in the 1940 Census at age 81. His brother seems to have been rather anonymous. Here’s a close-up of the thrift store with the painted advertisement. One could spend a whole day going up and down the old streets of Springfield. Here we see a faded old house next to a faded old church. My GPS did not accurately record this location—either because of my perennial problems with it or simply because sometimes GPS’s don’t geotag well in cities—which was very frustrating for me. But eventually I noticed that there was an embedded sign at the top of the front of the church and, when I zoomed in, I could read it: United Presbyterian. This was the First United Presbyterian Church of Springfield. The church, though not the building, dates all the way back to 1817. But I soon discovered that there were a bewildering array of Presbyterian churches in Springfield and an even more bewildering array of churches on Limestone, and my attempts to discover when the church was built, or when it stopped being a Presbyterian church were essentially all thwarted. I believe most recently, the building was used as a Vineyard church (for more on the Vineyarders, see my previous blog entry). I think the old house is part of the property, perhaps intended for whoever was minister at the time. If you know more about this place, give me a holler. More or less cattycorner to the church, on East Mulberry, was this old house, not yet abandoned, though certainly the worse for wear. The top of the house, which to me slightly resembles a mushroom cap over the structure, is interesting. I think there have once been other old houses to each side of this one, since torn down. This imposing structure would give almost anybody a bad case of porch envy. It’s just a hop away, at the intersection of West Mulberry and South Fountain. Again, look at the elaborate roof-work, the elaborate porch-work, everything. It seems pretty well kept up, too. I’d love to see it last at least another hundred years. Another home with a tower, because you just don’t know when you are going to need a lookout. This was also on South Fountain. 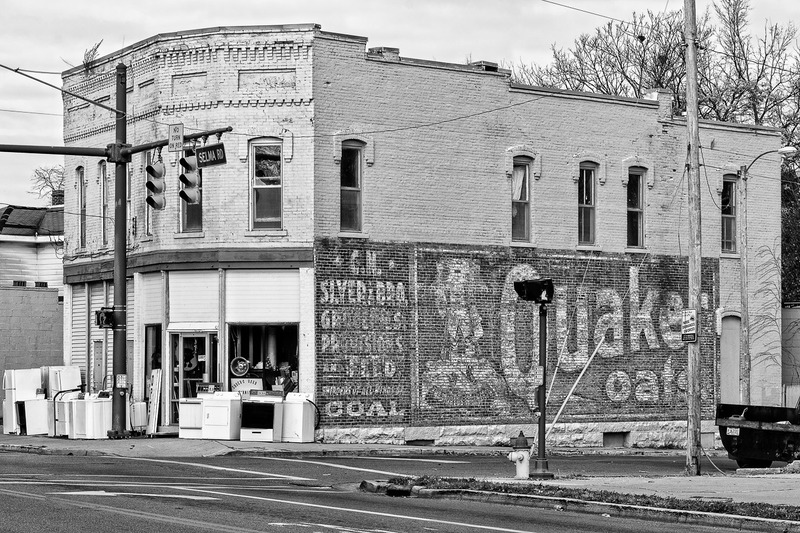 Most of these photos were taken in one area of the city, just to the south and southwest of downtown, which is where some of the old upscale residential neighborhoods were once located. 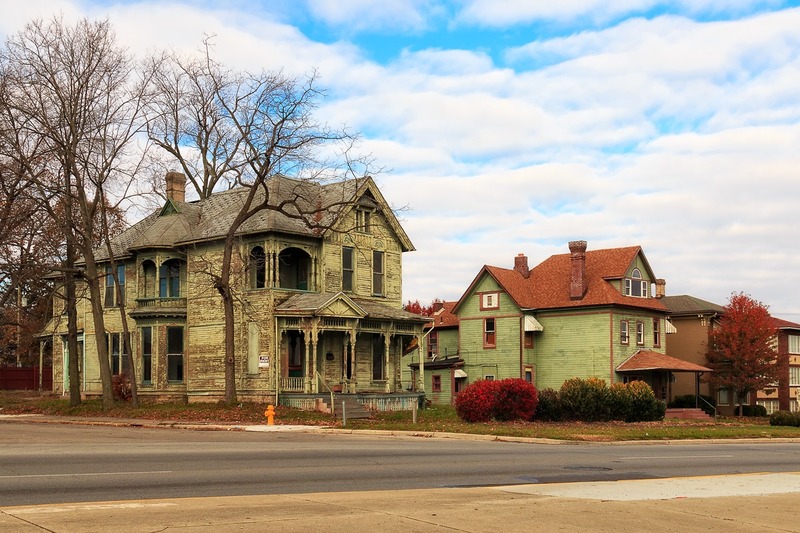 Sadly, more often than not, the old houses are the worse for wear, though this can vary considerably from street to street. 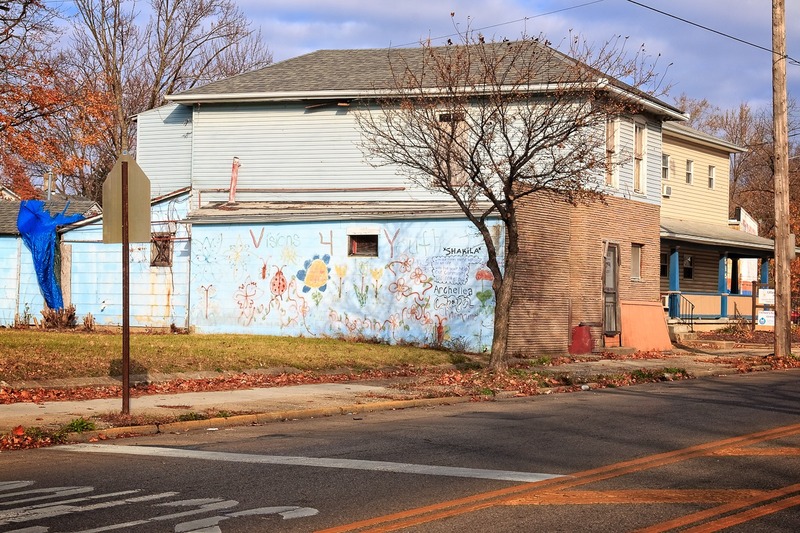 I couldn’t tell if this house, on West Pleasant & South Fountain, was still occupied or not. It could use a nice restoration, like so many other buildings in Springfield. 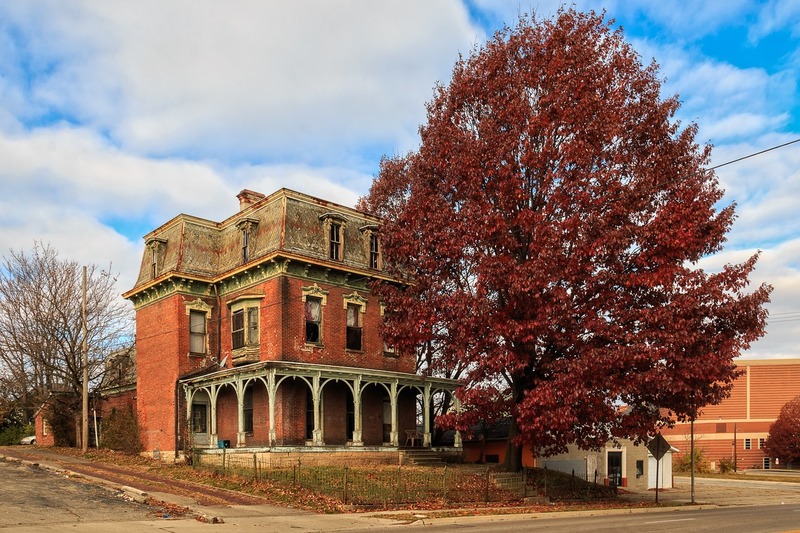 Springfield has a wealth of beautiful architecture from this period, but so much of it has not aged well. 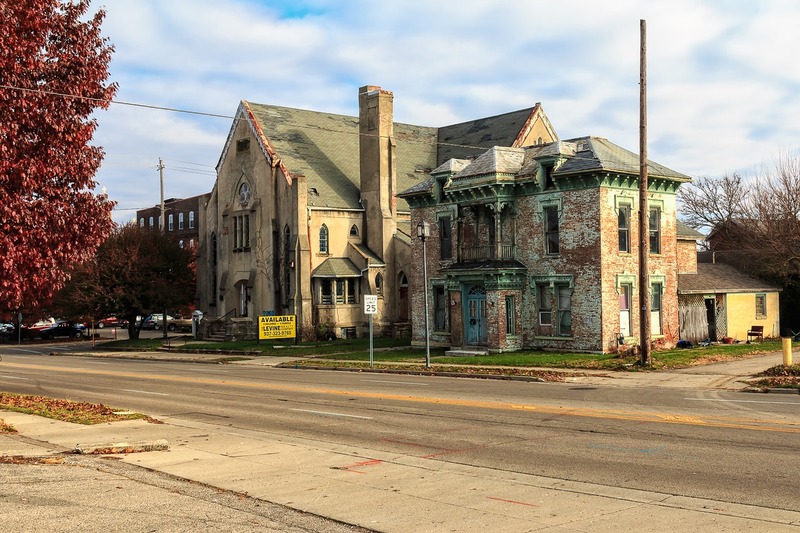 I wish it could somehow find the millions of dollars necessary to create a historic district and restore many of these buildings, but that will never happen. An odd sort of mural, seemingly drawn by children, though with slogans supplied by others, such as “without roots there would be no life, without your help our community cannot grow” and “There is peace in our neighborhood.” The writing at the top reads “Visions 4 Youth,” which makes me wonder if it is associated with “Visions for Youth,” a sort of boot-camp program. 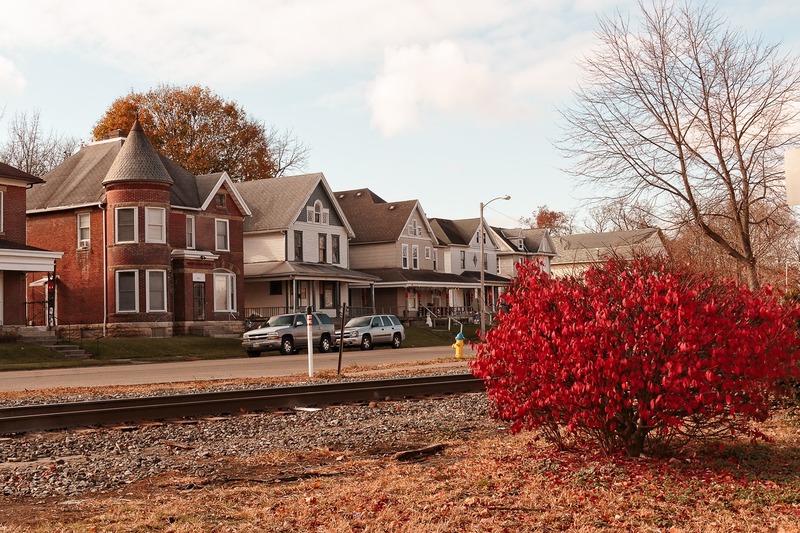 Not sure if this is the right side or the wrong side of the tracks, but I do like that house with the turret. One final house, still occupied, with a very shrunken porch indeed compared to most of the ones we’ve seen so far. A more utilitarian residence than the other places, quite possibly designed for multiple residences from the beginning. Here’s one final shot of Springfield, before we moved out into the countryside—Tsuki no doubt relieved that I had finally gotten my fill of Springfield. This is from the north end of town, not the south, and features a business, not a residence: Mike & Rosy’s Deli. Mike & Rosy are Mike Wagner and Bob Rosencrans, who opened this delicatessen in 1977. Mike was only 19 years old at the time; Rosy was then the athletic director at Wittenberg University (he passed away in 2004). In 2006, Mike and his two sons expanded the site to include a bar they called Rosy’s Press Box. I just fell in love with the place, including the signs that line the front of the building. I sent a copy of this photo to the deli, but never got a response; guess they didn’t like it. But I do and hope you as well. That’s enough for now; I’ll wrap up this excursion in another entry.